You’ve heard of trail mix. Now, Nurse Angry proudly presents…. Created by a three-year old to give old folks the stamina to get through the Christmas rush in town. Don’t head out to the galleria without a bag of this in your pocket. Stir carefully to desired consistency and eat with a fork until you can’t stand using it any more, fingers are then permitted. Observant readers may have noticed that not only is the white chocolate truffle missing, but Nurse Angry also omitted another key ingredient. 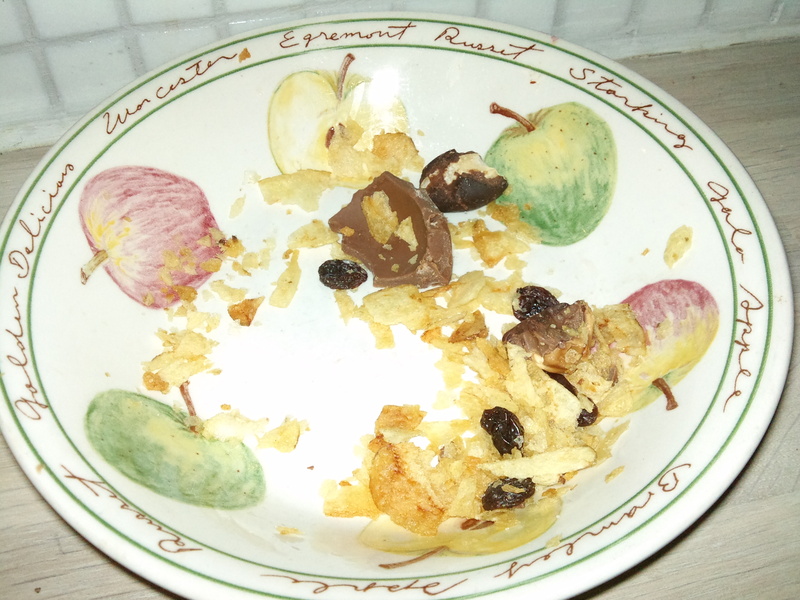 Seen mating with a raisin on the right side of the bowl: a gently bitten piece of Toffifay! Or Toffifee as it is known in some areas of the world. Nurse Angry just calls it delicious.